Nearly 200 years after the birth of photography, the art form is experiencing a technological revolution. Smartphones are using multiple cameras and software-based smarts to deliver images that seemingly transcend the limits of their small lenses and sensors. And while handsets have devastated sales of point-and-shoot cameras, the prospects for more advanced models are seemingly bright thanks to an innovation of their own. In recent weeks, the industry's biggest two manufacturers - Canon and Nikon - have both unveiled their first full-frame mirrorless cameras, having already seen Sony have great success with the format. Getting rid of the mirrors traditionally placed inside high-end cameras gets the lens closer to the sensor and paves the way to several innovations. And on the eve of Photokina - the industry's giant trade fair in Cologne - Panasonic has just unveiled a body that could prove the most disruptive of all. Dedicated digital camera sales grew by 5% in 2017 to $9.9bn (£7.5bn), according to market research firm Futuresource, the industry's first gain since 2010. It was driven in large part by demand from enthusiasts and professionals for existing mirrorless models costing upwards of £1,000. With a rush of new models - and their accompanying native lenses - manufacturers have an opportunity to prosper if they can convince consumers that the technology is worth the investment. What does mirrorless and full-frame mean? Mirrorless refers to the fact that the device does not include the flippable mirror found in digital single-lens reflex cameras (DSLRs) to show what the lens sees through the viewfinder. Instead, a small digital display is used to preview the image. In the past, using such a display involved lag - meaning the image was slightly delayed - and appreciably lower resolution than an optical viewfinder. But modern viewfinder displays have mostly addressed these issues, while also offering the benefits of being able to preview the effects that changes to camera settings make, as well as showing 100% coverage of the scene rather than the partial view shown by many DSLRs. The downside is that using an electronic display eats into battery life - reducing the number of shots possible on a charge. There are other benefits to mirrorless. Full-frame refers to the fact that the imaging sensor is about the same size as a frame of 35mm format film. For comparison's sake, the full-frame Sony A7 III's sensor is more than 18 times the size of that of the rear camera on the Galaxy S9 handset. The principal benefit of making a sensor larger is that it captures more light. The downsides include cost and the fact a larger sensor means a bulkier camera. So, what's the appeal of dropping thousands of pounds on a mirrorless camera and associated gear when a smartphone can capture perfectly decent snaps and auto-enhance them? There are clear advantages for professionals - sports photographers need high-quality zoom lenses, for example. Commercial photographers depend on the extra resolution required for large ad printouts. Fashion specialists rely on the cameras' superior colour science. And architectural specialists appreciate the extra dynamic range - which helps avoid details being lost in the shadows and brightest parts. "Pros will use whatever is the best tool," said Kaiman Wong, a self-declared photography nerd and YouTube reviewer. "They don't seem to care about brands, so long as it gets them the shot, and some I know have already gone mirrorless." But for manufacturers to justify the R&D costs required to drive mirrorless cameras forward, they also need to attract a lots of hobbyists. Kim Stone is one early adopter. Two years ago, the North Devon-based resident bought a Canon EOS M3 - a mirrorless camera but one with a smaller sensor than the forthcoming EOS R.
She uses it to take landscape photographs for her Instagram account despite the extra steps involved in getting them online. "It's the ability to be able to adjust the precise settings in the picture set-up," she explained. "Phones on the market don't offer you as much ease of control over the ISO [light sensitivity], white balance, shutter speed, and aperture. Smartphone lenses are also more restricted. "Ultimately, you can still only get such good results from a dedicated camera." Photokina offers the chance to compare the latest full-frame mirrorless models, several of which have yet to go on sale. Nikon's Z7 offers a class-leading 45.7 megapixels - useful for delivering huge prints or to tightly crop into an image after it is taken. When it comes to autofocus, Canon's EOS R may have the upper hand, thanks to its 5,655 manually selectable focus points. Both firms, however, have been criticised for providing only a single card storage slot. That prevents owners being able to create back-up copies of their photos and videos on the fly, which could be a problem if the data gets corrupted or lost. Panasonic, however, is teasing a model that promises to combine several cutting-edge features. 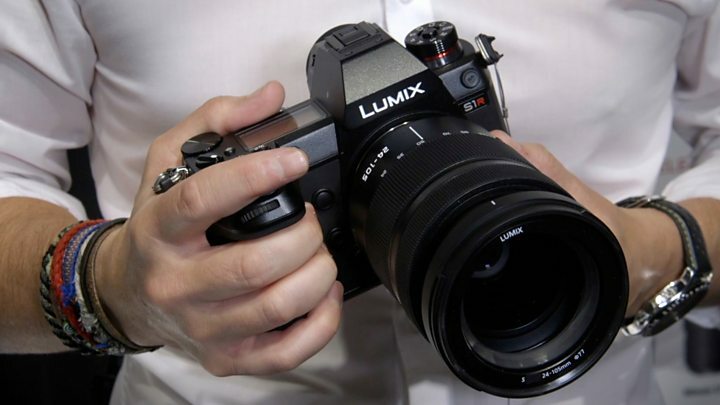 "Panasonic's move into the full-frame mirrorless segment is particularly interesting because of its collaboration with Leica and Sigma - both companies with a strong photographic heritage," Futursource analyst Arun Gill told the BBC. "By adopting Leica's L-Mount, Panasonic's cameras will have an immediate advantage of being compatible with several existing high-quality lenses." However, the firm has yet to say how much it will cost and the product will not go on sale until "early 2019". Its A7 III has been a runaway success, managing to hit a feature-price sweet spot. Indeed, the biggest complaint has been a lack of stock. Rumour sites, however, suggest Sony is biding its time ahead of an October event. But while there's much to be excited about with mirrorless now, the format may take some time to deliver on its true potential. One tantalising possibility is that it will eventually become possible to take photos in much quicker succession for longer periods of time, without having to sacrifice autofocus or picture quality. "If you can get 25 to 30 frames per second in full resolution, that's basically video," Mr Wong explained. "There will probably come a point when we are just taking video. "You'll take a frame out of that, and that will be the photo."